high-risk events and other emergencies. Unit ID also identifies a first responder who has activated the Emergency Call button during a crisis. And, Unit ID allows agencies to identify and immediately disable a lost or stolen device. The nationwide coverage provided by the NPSBN will allow public safety personnel using MCPTT to communicate with almost any other agency, including those far removed from their traditional service area. Personnel providing mutual aid or traveling through another agency's service area may need to request urgent assistance or request additional information about their assignment. 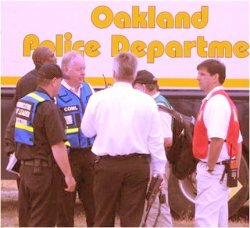 A key component of first responder safety is the ability for the PSAP to immediately determine the identity of those users, especially those in distress. This report provides high-level recommendations on the potential use of various MCPTT data fields to create a standardized approach to managing first responder identity. NPSTC thanks all the members of the LMR LTE Integration and Interoperability Working Group for their hard work in the development of this report. More than 200 members of the public safety community contributed to, or reviewed, this report including first responders and representatives of industry and academia. Attend Free Webinar: Getting to the Next Generation of Mission Critical Push to Talk, Wednesday, December 12 at 2 pm ET, Moderated by: Donny Jackson, IWCE's Urgent Communication with panelist Chris Kindelspire, Chair, NPSTC's LMR LTE Integration and Interoperability Working Group. Mission critical Push to Talk (MCPTT) is a Push to Talk over cellular standard developed by 3GPP (the global body that oversees LTE/5G standards) that is designed to meet the performance needs of public safety and other users that rely on mission-critical communications. MCPTT will be vital for first responders once solutions are established and tested, and initial steps are scheduled to happen this year. Explore the standard, performance concerns, device options, on-network or off-network (direct-mode) challenges and the Mission-Critical Open Platform initiative. Register here. NPSTC's Governing Board Elects Kevin McGinnis to Serve as Vice Chair. Kevin McGinnis, MPS, EMT-P, has been an EMS system builder since 1974. He started working on ambulances in Rhode Island and has held EMT, Paramedic, and instructor licenses in New York and Maine. Kevin has served as the primary Board Member, representing the National Association of State Emergency Medical Services Officials (NASEMSO). He served on the First Responder Network Authority (FirstNet) Board of Directors, until this summer. "I have been a NPSTC fan ever since I first understood its role in our community and had the opportunity to participate in its processes "fifteenish" years ago," he said. "Its credibility and depth of talent is a resource that benefits us all on an ongoing basis. I will make one of my priorities to be maintaining and nourishing this resource for our public safety colleagues." FCC Sends Message to LED Sign Marketers: Digital Light Displays Must Comply with FCC Rules. The FCC's Enforcement Bureau tells marketers of light-emitting diode (LED) signs they must ensure these lights comply with FCC rules. Since March of this year, the agency has entered into 21 settlement agreements with companies that marketed noncompliant LED signs in violation of the Communications Act and FCC rules. The settlements yielded approximately $850,000 in penalties paid to the U.S. Treasury and commitments to ensure compliance with the law going forward. Adherence to the FCC's equipment authorization and marketing rules is critical because radiofrequency emissions from the signs may cause harmful interference to licensed communications, such as wireless services. NPSTC Published Radio Frequency Interference from Energy-Efficient Lighting in June 2015. The report was in response to concerns raised by the public safety community. While the 2015 report was generalized on lighting, most of the problems the FCC has found are attributable to LED signs. Former NPSTC International Association of Fire Chiefs (IAFC) Representative and DeMello Award Winner, Chief Charles L. Werner (Ret.-Emeritus), Selected, as Homeland Security Today's Homeland Security Person of the Year 2018. "Annually, Homeland Security Today selects some very special people who support the mission of homeland and national security in their jobs," the announcement states. "Your contributions have been outstanding – you have truly helped take the nation forward on some of the most pressing challenges facing us." Learn more about the awards at https://www.gtscoalition.com/gtsc-awards/. On November 27th, Wes Rogers, DHS Emergency Communications Division (formerly OEC), Provided an Update on the "Incident Communications 2.0" Program and the Efforts to Improve and Expand the Communications Unit Leader (COML) Position within the National Incident Management System (NIMS). Significant work has been accomplished with multiple stakeholder groups to formalize public safety broadband and IT infrastructure functions. Discussions are also underway to examine the creation of a Communications Section Chief to elevate the critical role of communications in the overall NIMS organizational structure. Slides from this presentation are available here. NPSTC Outreach News and Related Public Safety News are now available on NPSTC's blog. Click on the orange icon above to check it out.